Yesterday I started with adding a JSON feed to the static tumblelog generator I wrote in Perl. I used the JSON Feed Version 1 specification which has sufficient examples. author - the author of the blog and feed. name - the name of the blog and feed. blog-url - the URL of the blog (not the feed). The first two are also available as variables in the HTML template. The latter is used to create the feed URL by adding feed.json. This feed-url is also available in the HTML template. Note that I use --delete with rsync because I want an exact copy of the local directory on the server. If you have already a site on the server and want to keep those files make sure to remove the --delete. 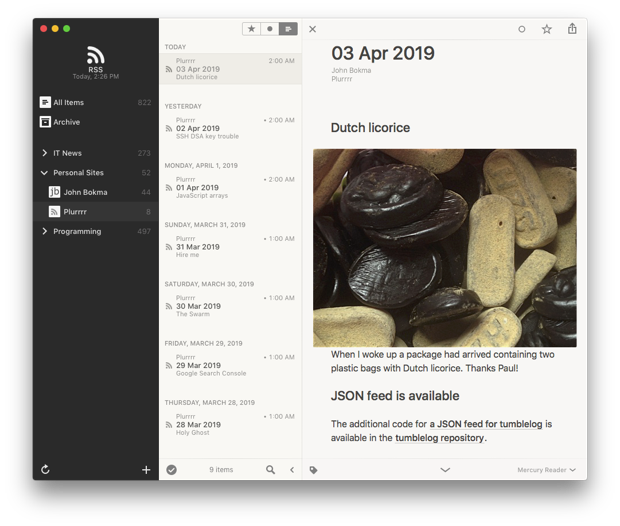 A screenshot of Reeder with the Plurrrr JSON feed open. Yesterday I tested the feed in Reeder on OS X and the program can handle JSON feeds. Today, however, I discovered that links to images can't be relative, which I guess is a bug. I will report this bug. Plurrrr - my tumblelog, an example.